Some people are truly gifted when it comes to painting a picture in someone’s mind, with just the use of the right words. This is a talent that can come more naturally for some than for others. 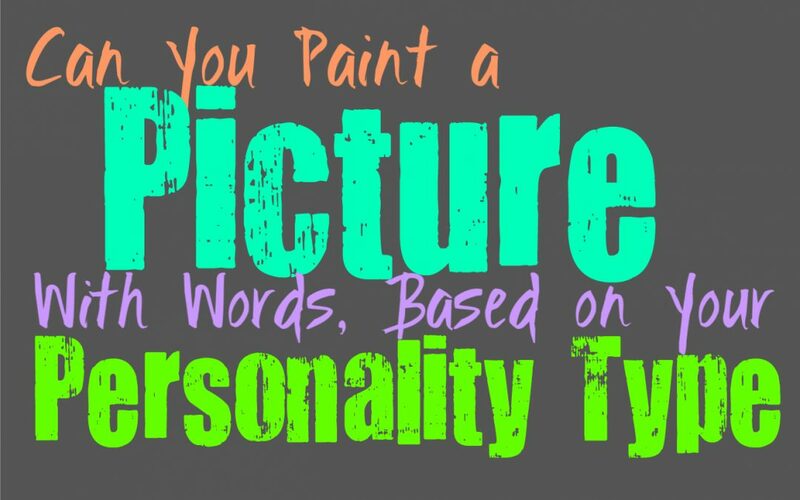 Here is how good you most likely are at painting a picture verbally, based on your personality type. INFJs are often rather good wordsmiths, but they also have rich and vibrant inner minds. This combination often helps the INFJ paint a rather vivid picture if they desire to do so. For the INFJ it is rewarding to be able to create a mental image of something and provide others with the path to this place. They enjoy being able to paint a rather vivid picture and bring others into it with them. This is something that most INFJs are capable of, and can become rather good at over time. Most INFJs fancy themselves writers in one way or another, even if they don’t spend a lot of time diving into this skill. ENFJs can definitely paint a picture with words, and are often great storytellers. They enjoy being able to create an idea of image in someone else’s mind simply by describing it. For ENFJs it is rewarding to be able to draw others into their own inner words, sometimes this is what they are doing when they write. They might not always find themselves wanting to dive into this skill, but it is something most ENFJs possess quite the knack for. Since they have such rich inner minds and are often good with words, most ENFJs are capable of painting a vivid picture. INFPs are often very imaginative people, who are usually drawn to the arts. This is because they have such deep inner emotions and complex minds, and so they often need some sort of outlet for this. Many INFPs find themselves drawn to reading and writing as a means of escaping and diving into something else. They enjoy painting a rather vivid picture for others, sometimes one that is a bit unusual but almost always powerful. For the INFP it is more about expressing themselves and sharing with others, but they are usually quite capable of painting a picture. ENFPs can definitely paint a vivid picture with their words, sometimes written and sometimes spoken. They can have a rather poetic and creative side to their personality, even if they don’t always express this to others. ENFPs can find themselves bouncing from one thing to the next, because they want to explore different sides of themselves. While they can sometimes be seen as more charming and easy to understand people, there is a much deeper part of them. This depth creates a sense of wonder, and makes the ENFPs creative side highly capable of painting a vivid picture. INTJs are often viewed as logical and focused people, but there is a lot more to them than this. Many people might not realize that the INTJ has a truly creative side to their personality, this just isn’t something they are always comfortable sharing with others. INTJs are often skilled at writing in a way that can be truly poetic and vivid. They have a knack for imagery and creating this incredible picture with just stringing the right words together. ENTJs are often seen as focused and very logical people, who work hard to get things done efficiently. While they are certainly interested in getting things done, that doesn’t mean there isn’t more to them than this. ENTJs often have a deeply creative soul, one that they can be nervous to actually share with people. Some ENTJs might not be as focused on writing, but the ones who are can often create a truly vivid image for others. Their imagery might be different than expected, but it is something they are often good at if they dig deep enough. INTPs are often truly creative people, and they are capable of painting a picture if they dig deep enough. It can be hard for them to really process their inner minds in a way that others can understand. Sometimes the way the INTP creates imagery can be a bit unusual to others, and might be only create a true image for those who can connect with. INTPs do have incredible creative and vivid inner worlds, but sometimes processing it in a way that is mainstream can be truly challenging. ENTPs are creative people, with truly vivid inner minds, and so they can often paint a picture for others. Their ability to connect with people can help the ENTP adapt and figure out the best way to make others understand them. ENTPs do their best to create imagery and express something in a way that can give the desired result. They sometimes enjoy being able to take others into another world with their descriptions of something, but sometimes they prefer to use comedy to do this. ISTJs aren’t usually fans of having to create imagery or paint a vivid picture, instead they prefer to use facts. They are more practical people who want to get straight to the point in order to get things done. While some ISTJs might enjoy writing, they usually have a more direct way of expressing or explaining things. They aren’t fans of having to overdo it with words in order to make something clear, and often prefer to make things clear in a very precise manner. ESTJs aren’t usually interested in wasting time having to paint some sort picture, instead they want to get to the point. ESTJs value getting things done as efficiently as possible and so they would rather explain themselves without having to get fancy about it. Most ESTJs don’t feel the need to paint a picture with their words, instead they want to get to the point and make their words rather precise and clear. ISFJs are often rather to the point people, but they can have a side of them that enjoy painting a picture for others. It often depends on the environment they grew up in, and what kind of people they have had in their lives. The ISFJ who has spent time around creative people, often enjoys that part of their personality and wants to see it thrive. They might even enjoy writing or spending time creating detailed imagery with their words. For the ISFJ it is mostly about who they are with, and if these things are something they feel free to express to those people. ESFJs have a creative side to their personality, but they don’t always have time or the ability to really express it. They can become so focused on the needs of others that they neglected their own desires. The ESFJ who is around creativity and feels safe diving into their own artistic side, will enjoy being able to create imagery with their words. They will want to paint a picture that others can easily visualize, and will enjoy honing that skill. ISTPs don’t usually spend a lot of time needing to create some sort of mental picture, since they are rather focused on the world around them. They can visualize things inside of their own minds, but they don’t necessarily feel a need to express that to others. ISTPs enjoy seeing things for real, instead of just imagining them. They want to dive into the real world, and really get to experience things firsthand without some sort of example given by someone else. ESTPs are good at describing things in detail, but it might not be the poetic imagery people expect. They enjoy describing things and explaining their thoughts and sometimes even their dreams. For the ESTP it is about recalling the facts and details, not just about creating a picture with their words. They do this so that others can really understand their experience and feel like they are connected to them. It isn’t always poetic but it does get to the point with a sense of precision. ISFPs often enjoy their more artistic side, and so they do enjoy being able to paint a picture with their words. They might not always share this with others, since their writing can be something very personal for ISFPs. Their imagery can be rather complex and poetic, and might even be difficult for others to fully understand. Their inner emotions are what help them paint a picture with their words, but this is often very passionate and intense. ESFPs often enjoy living in the real world and want to experience things firsthand. While they prefer to dive in and really feel what is around them, that doesn’t mean they are incapable of describing something in detail. ESFPs can often describe things in a way that others can really see what they are visualizing in their minds. They know how to paint a picture and also get others to feel connected to the description.